"When there is not enough to eat, people starve to death. It is better to let half of the people die so that the other half can eat their fill"
Sounds like something from the Marvel movie. Yeah, he's literally Thanos except he slowly starves half the people to death instead of just having them magically disappear into nothingness. Then he gets kids to lynch a million more people to further satisfy his bloodlust. So, worse than Thanos. 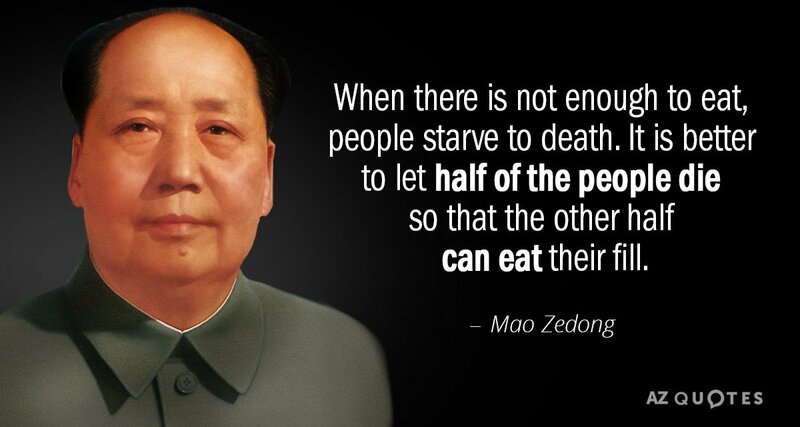 Post your leftist or whatever quotes here. If you are posting in image, please write out the content of the quote in the submission body, or in the title if it's not too big.